ResveraVital™ contains an exceptional blend of Trans-Resveratrol and Sulforaphane, both shown to help reduce free-radical damage and support normal cellular health. 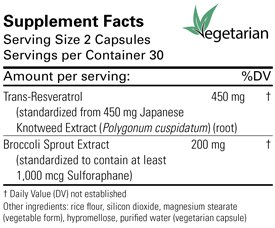 Most resveratrol supplements available in the U.S. originate from extracts of the root of Polygonal cuspidatum, also known as Hu Zhang or Japanese Knotweed. Red wine and red grape skin extracts also contain resveratrol and other polyphenols. ResveraVital™ contains only the most effective form of trans-resveratrol from standardized, quality-controlled extracts of Japanese Knotweed. In a 2009 review of clinical studies on the health effects of trans-resveratrol, researchers determined that the ingredient resveratrol may aid in reducing loss of cellular function that may be caused by free-radical damage as we age. Sulforaphane is an isothiocyanate compound, highly enriched in cruciferous vegetables such as cauliflower, cabbage, broccoli and broccoli sprouts, and a potent inducer of phase II detoxification enzymes. ResveraVital™ uses only standardized broccoli sprouts, which are known to contain high levels of this compound. Sulforaphane appears to work through the normalization of apoptosis and cellular growth, thus helping the body support normal cellular function. Sulforaphane possesses anti-inflammatory activity and has been shown to inhibit cytokine production in preclinical and clinical studies. 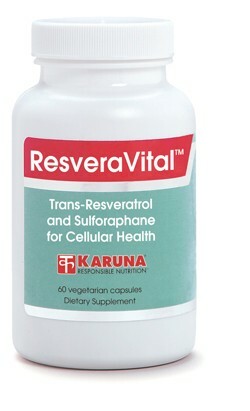 ResveraVital™ contains a unique combination of both trans-resveratrol and sulforophane for greater effectiveness. In a study published in Neurochemical Research, the effect of a combination treatment with resveratrol and sulforaphane was evaluated on the suppression of cellular growth and apoptosis induction in human cells. In summary, the study suggests that a combination of trans-resveratrol and sulforaphane is more effective than either compound alone. In a 2009 review of clinical studies on red wine's health effects, researchers determined that the ingredient resveratrol may aid in the prevention of age-related health issues that may be caused by free-radicals and inflammation. (Anticancer Res. 2004;24(5A):2). In a more recent study, trans-resveratrol supplements were found to suppress inflammation in a small group of adults (20 Patients). (Journal of Clinical Endocrinology & Metabolism, 2010). Sulforaphane is an isothiocyanate compound highly enriched in cruciferous vegetables, such as cauliflower, cabbage, broccoli and broccoli sprouts, and a potent inducer of phase II detoxification enzymes. (Mol Carcinog 2006;45:443–446). Sulforaphane appears to work by the normalization of apoptosis and cellular growth and thus helps the body support normal cellular function. (Mutat Res. 2007;635: 90–104). Sulforaphane possesses anti-inflammatory activity, as it inhibited cytokine production in preclinical and clinical studies. (Antioxid Redox Signal. (2005). The effect of a combination treatment with resveratrol and sulforaphane was evaluated on the suppression of cellular growth and apoptosis induction in human cells. In summary, the study suggests that a combination of trans-resveratrol and sulforaphane is more effective than the either compound alone. (Neurochem Res. 2010 Jan.; 35(1): 152). Resveratrol appears to be safe when used at levels that do not exceed 1-1.5 grams per day. Sulforaphane is generally used in lower levels and has not shown any side effects. (Ann N Y Acad Sci. 2011 Jan;1215:131-7). Suggested use for adults: Take one (1) capsule twice a day with a full glass of water, or as directed.